Are you looking for an affordable RC transmitter for your FPV drone? Don’t look any further because the Turnigy Evolution is the one for you! 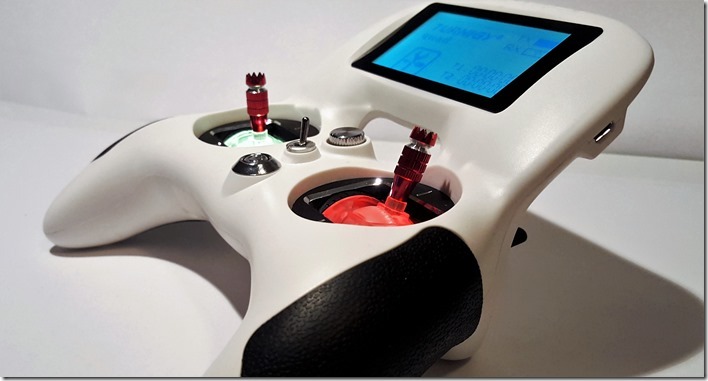 This transmitter is designed for FPV racers in mind. 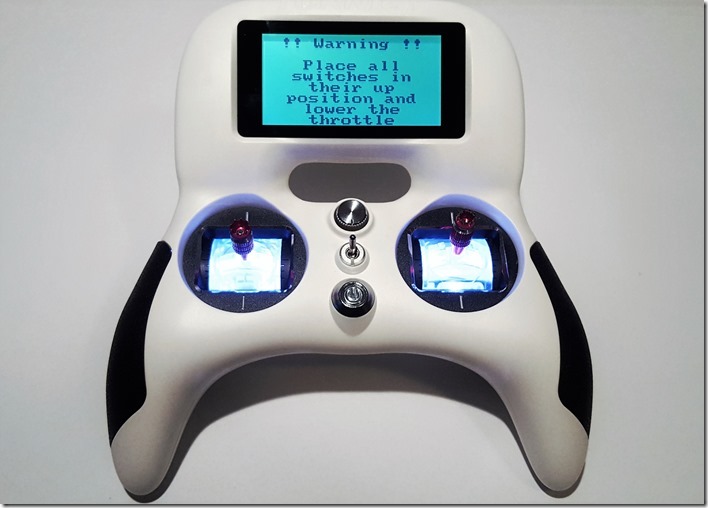 It feels and looks like a game controller, but within seconds after you hold this transmitter you will understand why HobbyKing choose this design. It feels like it’s molded to your hands. The Turnigy Evolution Digital AFHDS Radio Control System runs on 2.4GHz AFHDS A2 with 8 channels and it comes with a TGV-IA6C receiver. It has two omnidirectional gain antennas build into the case for a solid radio link. It’s got a backlit LCD touchscreen on top for programming, two 3-position switches, a potentiometer knob and 5 model memory build in. And all this for a price of approximately $70. The transmitter arrives in a nice big box which protects from damaging the inside components. After I have unpacked the transmitter, and hold it for the first time, my first reaction was: WOW, this feels good! It’s small, lightweight and well balanced. The sticks are close together, what makes this a perfect transmitter for a thumber. Pinching is possible but more difficult. Overall the Evolution feels nice and steady. It shows its quality by the smooth feeling of the ball bearing gimbals. The switches are stiff and solid and the potentiometer knob feels precise. So let’s turn this thing on! The first thing we will see is a warning which tells us to put all the switches in the up position and the throttle to zero. I love this feature because you will never accidentally set your arm switch. After this warning, we will enter the front page. You can scroll from left to right between two pages. Number one is the main page and number two the channel page. Via the main page you can enter the timer, the TX/RX setup for battery voltage/battery voltage alarm settings and the settings menu. The first thing you want to do is to bind your receiver to the evolution. This is super easy! 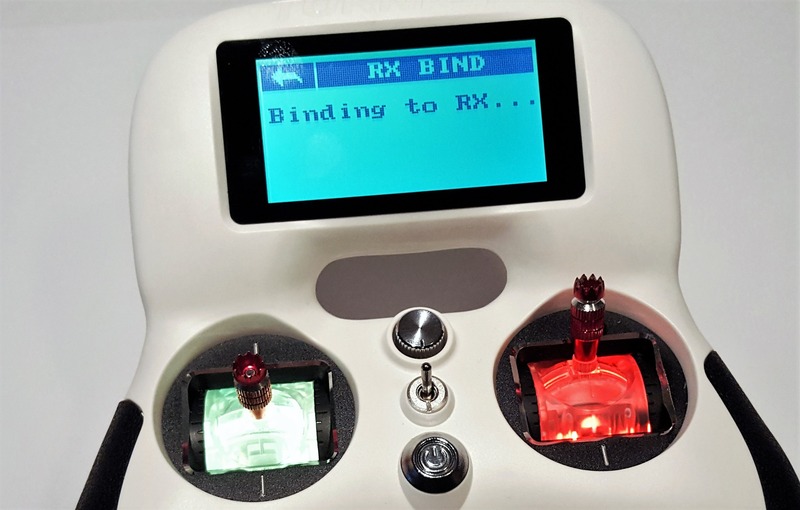 Just click on RX bind in the settings menu of your Evolution, power up your receiver and voila, your receiver is connected to your Evolution. One thing that annoys people is the 5 model memory. But a beautiful thing about quadcopters is you program everything in your flight controller. So the only thing you have to do is set one model in your transmitter and as long as you fly the same protocol, you just have to click RX bind when you use your other quads and you are ready to go. Damn, I love technology. The settings menu is very easy to navigate, everything is controlled via the touchscreen and the terms speak for themselves. One important step is setting the right output mode. Here you can choose between PPM, PWM, IBUS and SBUS. Make sure you have the same output mode selected in your configurator and transmitter otherwise it won’t work. A very nice gimmick on this transmitter is the led setup. You can change the colors of the gimbals! You can choose one RGB color, or chose to change the gimbal color by increasing or decreasing your stick input. This looks very nice. Note: To calibrate the sticks hold both sticks left and down on power-up. Another nice feature of the evolution is the battery voltage monitor. 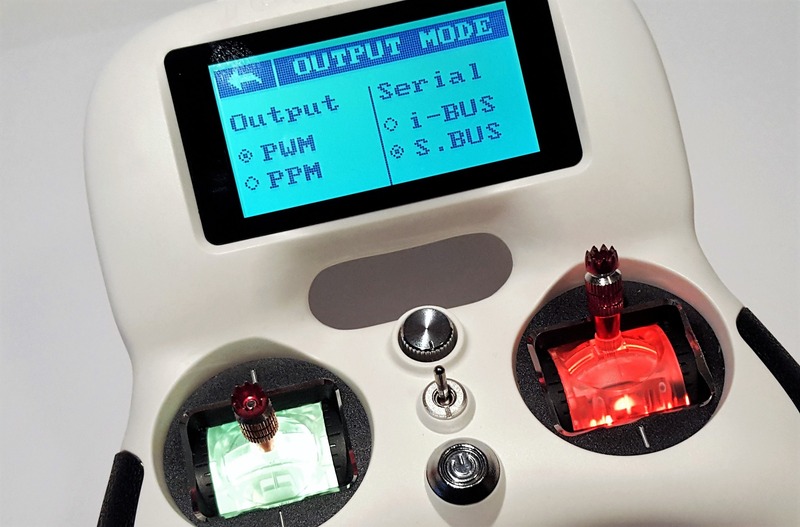 This transmitter doesn’t have advanced telemetry, but you can read out your drone battery voltage by connecting the B-DET + en – from your IA6C receiver to your PDB. 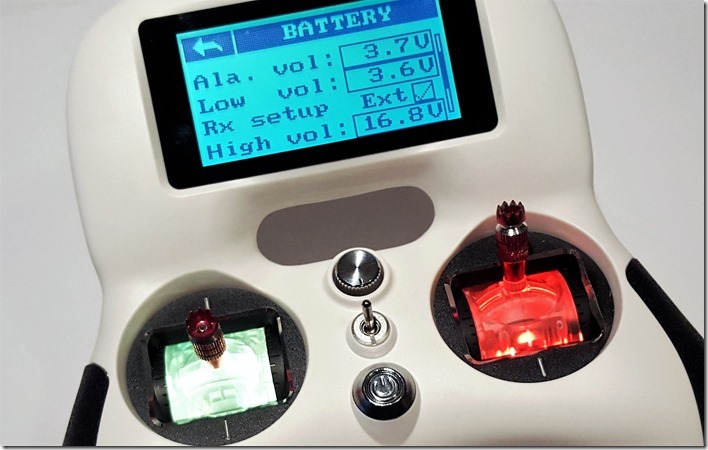 Now you have battery voltage monitoring and you can select your amount of cells. After you selected your amount of cells you can setup your high voltage, your alarm voltage and your low voltage. When your battery reaches the alarm voltage it will start beeping, and the gimbals will start flashing red. The only problem is the beeper, this beeper isn’t loud enough to hear when flying with surrounding noise. Hopefully, Turnigy will make a firmware update to solve this problem. The TGV-IA6C receiver that comes with the transmitter has a standard size just like the FrSky D4R-II. It´s slightly thicker (about 1mm) because of the heat shield. This receiver works on PPM/IBUS and SBUS. I recommend using IBUS if possible. This is the most stable protocol for this transmitter and receiver. At the moment the IA6C is the smallest and only receiver from Turnigy compatible with the Evolution. However, you can also use the Flysky receivers with AFHDS A2 protocol. So receivers like the FS X6B and the FS A8S are also compatible and easy to use with the Evolution transmitter. These receivers are smaller as the IA6C. – Gimbals: These things are butter smooth! Overall the Turnigy Evolution is one of the best transmitters at the moment on the market. 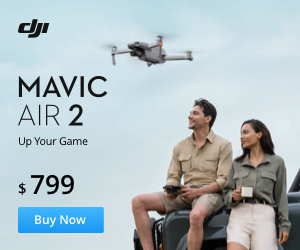 Nothing can compare to its gimbals and its ergonomics! And actually, this is all you need in a transmitter to fly racing quads in my opinion. You can’t compare it to an advanced FrSky Taranis transmitter, but it costs also more than 3 time the price of an Evolution. 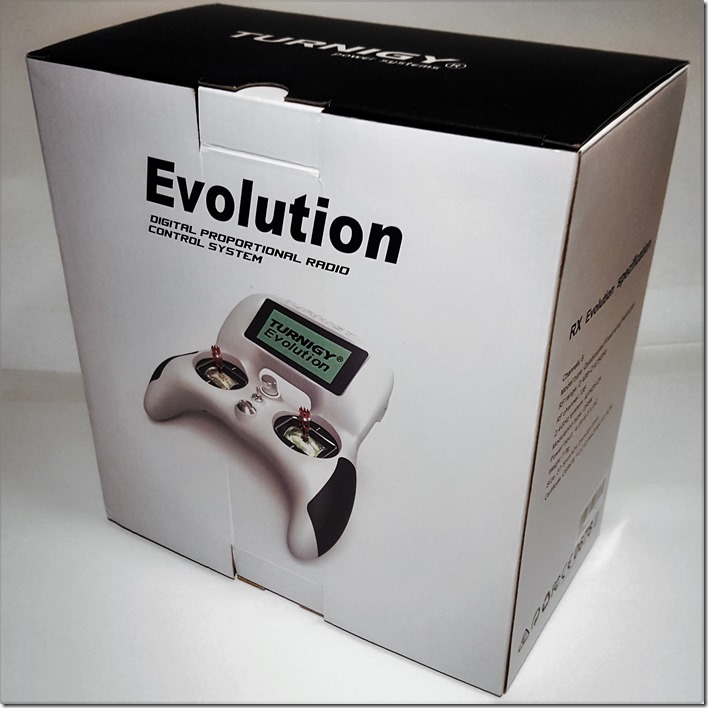 If you don’t have a Taranis and you are looking for a great affordable transmitter for an FPV drone racer go and get your Turnigy Evolution! Update 2017-07: If you are looking for an affordable transmitter, check out the new FrSky Taranis Q X7. I want to say thanks to my guest author Niels for this great review! Give him a thumbs up and follow him on Instagram for more FPV stories! I would like to use the Turnigy Evolution to use a Tiny Whoop. How is the Evolution different from the FrSky transmitter? What would I need to confirm in a Tiny Whoop in order to use with Evolution? I have just recently purchased the Evolution. New to all this. Have also purchased a 2nd Racing drone. The drone had a Frsky receiver which I had to remove and fitted the receiver that came with the Tx. I can now bind the two but cannot fathom out how to arm the thing. I have downloaded Betaflight. In the Output Settings on the turnigy evolution make sure you are in PPM and ibus. The controller can’t communicate with drone even if the receiver is bound. Try changing the Output Settings until it connects, it won’t break anything. Hello Robert, I believe Hubsan has their own radio protocol, which is not compatible with Turnigy/FlySky one. Thank you. I have ordered the Turnigy Evolution.